The following Terms of Service ("Agreement") govern the use of the iMediChart services by iMediChart subscribers. Please read the following terms and conditions carefully as they are legally binding. You may register adult or other family members on the condition that the adult or the other family member either accepts the Terms of Service separately before their account activates or you have conservatorship over the adult or the other family member. iMediChart RESERVES THE RIGHT TO MODIFY THESE TERMS AND CONDITIONS AT ANY TIME AND WILL NOTIFY YOU OF ANY SUCH CHANGES BY EMAIL. NOTHING IN iMediChart'S BROCHURES, FAQ's OR OTHER COMMUNICATIONS DESCRIBING ITS SERVICES IS INTENDED TO SUPERSEDE OR MODIFY THESE TERMS AND CONDITIONS IN ANY MANNER. iMediChart's services are designed to enable you to summarize your health or medical status into one chart, to make comments about specific entries in your iMediChart record about your health in general, to review this profile at your convenience, and to give specific authorization to others who may access your profile. iMediChart's services are entirely dependent upon your own actions and any information you submit to us. YOU ACKNOWLEDGE AND AGREE THAT iMediChart IS NOT A PROVIDER OF MEDICAL OR HEALTH CARE SERVICES AND DOES NOT PRACTICE MEDICINE, OR GIVE MEDICAL ADVICE. THE SERVICES OFFERED BY iMediChart ON THIS SITE, INCLUDING INFORMATION YOU PROVIDE TO iMediChart, IS FOR INFORMATIONAL PURPOSES ONLY. SHOULD YOU HAVE ANY HEALTH-RELATED QUESTIONS OR CONCERNS ABOUT YOUR HEALTH OR MEDICAL STATUS, PLEASE CALL OR SEE YOUR PHYSICIAN OR OTHER HEALTHCARE PROVIDER PROMPTLY. THE TRANSMISSION AND RECEIPT OF INFORMATION CONTAINED ON THIS SITE, IN WHOLE OR IN PART, OR COMMUNICATION VIA THE INTERNET OR E-MAIL DOES NOT CONSTITUTE OR CREATE A DOCTOR-PATIENT, OR OTHER HEALTHCARE PROFESSIONAL RELATIONSHIP BETWEEN YOU AND iMediChart. YOU UNDERSTAND AND AGREE THAT iMediChart DOES NOT EDIT THE CONTENTS OF YOUR CHART OR RENDER ANY OPINION OR JUDGMENT REGARDING YOUR MEDICAL HEALTH OR PHYSICIANS' CARE. iMediChart IS NOT SUBJECT TO THE HEALTH INSURANCE PORTABILITY AND ACCOUNTABILITY ACT ("HIPAA") WHICH REGULATES HOW HEALTH CARE PROVIDERS AND OTHER COVERED ENTITIES MUST HANDLE AND PROTECT HEALTHCARE INFORMATION OF THEIR PATIENTS. WHILE iMediChart IS NOT REQUIRED TO COMPLY WITH HIPAA MEDICAL INFORMATION PRIVACY LAWS, iMediChart HAS USED THE HIPAA REGULATIONS AS A GUIDELINE FOR ITS OWN POLICIES AND PROCEDURES WITH RESPECT TO YOUR PERSONAL INFORMATION. The medical profile provided by you and stored by iMediChart does not include copies of the official and authoritative medical records that are maintained by your health care providers. Therefore, the information kept by iMediChart is intended only to augment the use, organization and delivery of your medical information. In any event where, in your opinion or the opinion of your healthcare provider, the original and authoritative medical records in the possession of your health care providers or additional direct copies of such documents, may allow better and/or more timely healthcare decisions or might be important or vital to the quality of your health care, especially in emergency situations, you acknowledge and agree that such original medical records are the primary and authoritative source for your medical and health care information. Whenever you and your health care providers think doing so is important or vital to your care, iMediChart strongly suggests that you locate, access and provide your health care providers with the original and authoritative copies of your medical records. REGARDLESS OF ANY VALUE ADDED BY iMediChart, ITS PRODUCTS OR SERVICES TO THE MANAGEMENT OF YOURHEALTH OR MEDICAL CONDITION, YOU ACKNOWLEDGE AND AGREE THAT THE USE BY YOU, OR BY ANY HEALTH CARE PROVIDERS YOU AUTHORIZE TO HAVE ACCESS TO YOUR MEDICAL INFORMATION, OF ANY OF iMediChart'S SERVICES OR PRODUCTS, INCLUDING, BUT NOT LIMITED TO, ORGANIZATIONAL SCHEMES, DOCUMENT LOGS, OR MEDICAL SUMMARIES, IS INTENDED ONLY TO AUGMENT, AND NOT TO REPLACE, THE USE OF YOUR ORIGINAL MEDICAL RECORDS MANAGED BY THE ORIGINAL MEDICAL RECORD PROVIDERS, THE USE OF THE ORIGINAL ORGANIZATION AND CONTENT OF SUCH ORIGINAL MEDICAL RECORDS, OR THE RECORD MANAGEMENT DOCUMENT LOCATION, SEARCH OR DISTRIBUTION SERVICES AS PROVIDED BY YOUR HEALTH CARE PROVIDERS DIRECTLY. YOU ACKNOWLEDGE AND AGREE THAT iMediChart IS NOT RESPONSIBLE FOR (i) THE CONTENT OF YOUR iMediChart RECORDS. , (ii) THE COMPLETENESS OR ACCURACY OF YOUR iMediChart RECORDS, (iii) ANY MEDICAL DIAGNOSIS OR DECISION BY YOUR HEALTH CARE PROVIDER THAT IS BASED IN WHOLE OR IN PART ON YOUR iMediChart RECORD OR ON THE INFORMATION WE PROVIDE, PURSUANT TO YOUR AUTHORIZATION, TO YOUR HEALTH CARE PROVIDER, OR (iv) ANY MISSING RECORDS OR OMISSIONS FROM YOUR CHART OR FROM YOUR MEDICAL PROFILE, REGARDLESS OF WHETHER THE CONTENT OF THE MEDICAL RECORDS OR THE MISSING OR OMITTED INFORMATION HAS BEEN PROVIDED TO iMediChart BY YOU OR BY YOUR HEALTH CARE PROVIDERS. YOU ACKNOWLEDGE AND AGREE THAT iMediChart IS NOT RESPONSIBLE FOR ANY ADVERSE CONDITIONS OR EVENTS THAT MAY BE CAUSED, IN WHOLE OR IN PART, BY ANY INACCURACIES OR OMISSIONS IN YOUR iMediChart RECORDS, OR THE UNAVAILABILITY OF YOUR iMediChart RECORDS. iMediChart will index, or categorize your profile in an effort to make such information more accessible and usable to health care providers you authorize to have access to your information. iMediChart will make good faith efforts to categorize each page correctly, iMediChart cannot assure, however, that all of your information will be accurately characterized. YOU ACKNOWLEDGE AND AGREE THAT iMediChart IS NOT RESPONSIBLE FOR ANY ADVERSE CONDITIONS OR EVENTS THAT MAY BE CAUSED, IN WHOLE OR IN PART, BY MISCHARACTERIZATION, OR MISFILING OF YOUR PROFILE, DOCUMENTS OR OTHER DATA; iMediChart IS NOT RESPONSIBLE FOR ANY DAMAGE TO YOUR iMediChart RECORDS RESULTING FROM A TECHNICAL FAILURE OR COMPUTER VIRUS. YOU ACKNOWLEDGE AND AGREE THAT iMediChart'S SERVICES ARE SOLELY BASED ON INFORMATION YOU PROVIDE. YOUR HEALTHCARE PROVIDERS CONTINUE TO BE RESPONSIBLE FOR THE ORIGINAL AND AUTHORITATIVE COPIES OF YOUR RECORDS. YOU ACKNOWLEDGE AND AGREE THAT IT IS YOUR RESPONSIBILITY TO MAINTAIN PAPER COPIES OF YOUR RECORDS, AND TO REQUEST A TRANSFER OF THE ORIGINAL, AUTHORITATIVE COPIES OF YOUR RECORDS FROM PAST CARE PROVIDERS TO CURRENT CARE PROVIDERS AS APPROPRIATE AND ENSURE THAT THE RECORDS AND INFORMATION iMediChart HAS ARE CURRENT AND ACCURATE. You may contact iMediChart with questions about your account, receive technical assistance or information about our services by calling our Customer Service Call Center at 248.918.4685. In the event of interruptions in electric power, phone lines, internet connections or other means of communication, or if any other events beyond iMediChart's control (including but not limited to Acts of God, Acts of War or Acts of Terrorism), access to the Site, iMediChart's business office may be disrupted for a period of time or even permanently. YOU ACKNOWLEDGE AND AGREE THAT iMediChart IS NOT RESPONSIBLE FOR ANY ADVERSE CONDITION OR EVENT OCCURRING DUE TO AN INTERRUPTION OF SERVICE FOR REASONS BEYOND iMediChart'S CONTROL. iMediChart does not warrant that information it provides on your behalf, and as authorized by you, will be complete or appropriate for any specific medical emergency. BY AGREEING TO THESE TERMS OF SERVICE YOU ARE SPECIFICALLY CONSENTING AND AUTHORIZING THAT iMediChart, IN A MEDICAL EMERGENCY, MAY PROVIDE ALL INFORMATION IN ITS POSSESSION TO MEDICAL PERSONNEL. iMediChart WILL MAKE A GOOD FAITH ATTEMPT TO VERIFY THAT THE INFORMATION IS BEING FORWARDED TO AUTHORIZED MEDICAL PERSONNEL BEFORE PROVIDING ACCESS TO YOUR PROTECTED HEALTH INFORMATION, OR PHI. NOTWITHSTANDING iMediChart'S GOOD FAITH ATTEMPT AT VERIFICATION, YOUR PHI MAY INADVERTENTLY BE PROVIDED TO A PERSON WHO IS NOT AN AUTHORIZED RECIPIENT. YOU ACKNOWLEDGE AND AGREE THAT iMediChart IS NOT RESPONSIBLE FOR ANY ADVERSE CONDITION OR EVENT, INCLUDING ANY VIOLATION OF YOUR RIGHTS OF PRIVACY OR MISUSE OR CHANGES TO YOUR MEDICAL INFORMATION, THAT MAY BE CAUSED, IN WHOLE OR IN PART, BY YOUR FAILURE TO SAFEGUARD THE CONFIDENTIALITY OF YOUR ACCESS CODES, OR UPDATE YOUR MEDICAL INFORMATION. YOU ACKNOWLEDGE AND AGREE THAT iMediChart IS NOT A PROVIDER OF MEDICAL OR HEALTH CARE SERVICES AND DOES NOT PRACTICE MEDICINE, OR GIVE MEDICAL ADVICE. NO PHYSICIAN/PATIENT OR OTHER HEALTHCARE/PATIENT RELATIONSHIP HAS BEEN ESTABLISHED BETWEEN YOU AND iMediChart. YOU UNDERSTAND AND AGREE THAT iMediChart DOES NOT EDIT THE CONTENTS OF YOUR CHART OR RENDER ANY OPINION OR JUDGMENT REGARDING YOUR MEDICAL HEALTH OR PHYSICIANS' CARE. Your authorized use of our Site is limited to learning more about iMediChart and its services, registration as a member of iMediChart and use of the iMediChart services, including accessing records and preparing medical summaries, available through the Site. You agree not to use our Site for any other uses, including, without limitation, to store, aggregate, reproduce or distribute information available on the Site in any manner; to interfere with or disrupt the operation of the Site or the networks or servers connected to the Site in any manner; to impersonate any person or entity or otherwise misrepresent your affiliation with any person or entity; to upload, post or otherwise transmit any content that infringes the proprietary rights of any third party, or is otherwise unlawful or offensive; to harass or otherwise harm iMediChart or any other person or entity; or to engage in commercial activities of any kind. Any unauthorized use of the Site will result in termination of all rights to use the Site and iMediChart taking action against you to the full extent provided for by law. You agree to pay all charges incurred in connection with your Access Codes for the iMediChart services (including any applicable taxes) at the rates in effect when the charges were incurred. iMediChart may change the fees and charges then in effect, or add new charges, by giving you advance notice by email. The fees for all iMediChart services are set forth on our Site. YOU ACKNOWLEDGE AND AGREE THAT YOU WILL PAY FOR ALL REQUESTED iMediChart SERVICES AND PRODUCTS IN ACCORDANCE WITH iMediChart'S PRICING GUIDELINES. Failure to pay for services or products as hereby agreed may result in additional late payment charges and/or collection charges that may include charges for collection services incurred by iMediChart in its lawful efforts to collect any and all of your past due amounts. At the end of your subscription, you will be automatically renewed at the then-current renewal rate (billed to the credit card we have on file). This does not apply to gift certificates or other special discount programs. You agree that your use of the iMediChart services and this Site is entirely at your own risk. WITHOUT LIMITING ANY OF THE FOREGOING, EVERYTHING AVAILABLE THROUGH iMediChart, WHETHER THROUGH OUR SITE OR BY PHONE, FAX, EMAIL, OR CONVENTIONAL MAIL OR OTHER DELIVERY SERVICES, IS PROVIDED "AS IS" AND "AS AVAILABLE" WITHOUT WARRANTY OF ANY KIND EITHER EXPRESSED OR IMPLIED AS TO THE ACCURACY, COMPLETENESS, CURRENTNESS, RELIABILITY, TIMELINESS, OR FITNESS FOR A PARTICULAR PURPOSE OF ANY INFORMATION iMediChart COLLECTS, STORES, USES, PROVIDES ACCESS TO OR DISTRIBUTES ABOUT YOU. iMediChart does not make any representations or warranties that any services or materials available through iMediChart, whether through the Site, or by phone, fax, email or mail, will meet your requirements or expectations or that the operation of our services and/or of the Site will be uninterrupted, timely, secure or error free. Some jurisdictions do not allow the exclusion of certain warranties, so some or all of the above exclusions may not apply to you. IN NO EVENT SHALL iMediChart OR ITS AFFILIATES, AGENTS OR LICENSORS BE LIABLE TO YOU OR ANYONE ELSE IN CONNECTION WITH THIS AGREEMENT FOR ANY LOSS, INJURY, OR HEALTH PROBLEMS CAUSED IN WHOLE OR PART BY ITS NEGLIGENCE OR CONTINGENCIES BEYOND ITS CONTROL IN PROCURING, COMPILING, INTERPRETING, STORING, ACCESSING, REPORTING, OR DELIVERING INFORMATION. IN NO EVENT WILL iMediChart, ITS AFFILIATES, AGENTS OR LICENSORS BE LIABLE TO YOU OR ANYONE ELSE FOR ANY DECISION MADE OR ACTION TAKEN OR NOT TAKEN BY YOU OR YOURHEALTHCARE PROVIDERS IN RELIANCE ON SUCH INFORMATION. iMediChart AND ITS AFFILIATES, AGENTS AND LICENSORS SHALL NOT BE LIABLE TO YOU OR ANYONE ELSE FOR ANY DAMAGES INCLUDING ANY SPECIAL, CONSEQUENTIAL, INDIRECT, INCIDENTAL OR RELIANCE DAMAGES (OR ANY LOSS OF REVENUE, PROFITS OR DATA OR COSTS OF COVER), HOWEVER CAUSED, WHETHER FOR BREACH OF CONTRACT OR TORT, (INCLUDING PRODUCTS LIABILITY, STRICT LIABILITY AND NEGLIGENCE), OR UNDER ANY OTHER LEGAL THEORY, WHETHER FORESEEABLE OR NOT AND WHETHER OR NOT iMediChart HAS BEEN ADVISED OF THE POSSIBILITY OF SUCH DAMAGE. THESE LIMITATIONS SHALL APPLY NOTWITHSTANDING THE FAILURE OF ESSENTIAL PURPOSE OF ANY LIMITED REMEDY. In consideration for the iMediChart services provided to you, you acknowledge and hereby agree to grant iMediChart exclusive commercial rights to store, index, manage, copy and/or distribute to authorized recipients your electronic medical profile in any electronic format as collected, stored or distributed by iMediChart for a period concurrent with your membership, or, in the event that your membership is terminated for any reason whatsoever, for a period extending from your initial registration until six (6) years after the termination of your iMediChart membership account. Such exclusive commercial rights will include use of any electronic copy of iMediChart-based records and information regardless of whether such copy is made from the Site or from any other iMediChart authorized or unauthorized electronic medium. The foregoing exclusive commercial rights: (i) Are limited to all electronic copies produced by or derived from iMediChart's services or products and all products and services derived in any way from iMediChart products and services that you have purchased; (ii) Do not in any way limit the commercial or other use of your original and authoritative medical records that are in your possession or the possession of your health care providers; and (iii) Do not in any way limit the creation or use of alternative electronic copies of your original medical records-as long as iMediChart's services or products were not involved directly or indirectly in the creation of such alternative electronic copies. YOU HEREBY GRANT iMediChart THE LIMITED AND EXCLUSIVE COMMERCIAL RIGHTS DESCRIBED IN THE FOREGOING PARAGRAPHS. You agree that iMediChart is not responsible and will not be held liable for any third party content on this Site or any third-party content, products or services available on another web site through a link from this Site. Links to third-party sites are for your convenience only, and their inclusion on this Site does not imply any endorsement, guarantee, warranty or representation by iMediChart. This Site and all materials on the Site, including, without limitation, all databases and all trademarks and logos on the Site, are protected by copyrights, trademarks, service marks, patents or other proprietary rights and laws. Except as specifically permitted in this Agreement or by express written consent of iMediChart, you agree that you shall not use the Site or the material on the Site in any manner. This Agreement is effective as of the date you register for any services or products through iMediChart. The Agreement shall continue in force for at least the term specified in the registration confirmation materials you receive from iMediChart and shall renew automatically for the same term and continue in force unless and until it is terminated in one of the following ways: (a) iMediChart may terminate this Agreement by notifying you in writing (including e-mail) if iMediChart determines in its sole discretion that you have made unauthorized use of the Site, failed to pay any charges due or otherwise breached this Agreement. Such termination shall be effective without further notice to you if you fail to cure the breach within thirty (30) days of the date of iMediChart's notice to you; (b) You may terminate this Agreement by notifying iMediChart in writing by no later than thirty (30) days before the expiration of the term of service specified in your registration confirmation materials that you do not want your membership to renew. Such termination shall be effective as of the date of expiration of the then-current term of service; (c) iMediChart may terminate this Agreement by notifying you in writing and by email thirty (30) days before the expiration of the term of service specified in your registration confirmation materials that it will not be renewing your membership. Such termination shall be effective as of the date of expiration of the then-current term of service. iMediChart shall not be responsible for any failure by you, or your medical provider who was provide authorization to access your information, to access your records as a result of iMediChart's termination of your account. Upon termination of this Agreement in accordance with subsection (a) or (b) above, you shall remain obligated to make all payments due to iMediChart for the remainder of any current term or terms of service. This Agreement shall be governed by the laws of the State of Michigan without regard to its conflict of law provisions. Both parties submit to personal jurisdiction in Michigan and further agree that any cause of action relating to this Agreement shall be brought in a court in Oakland County, Michigan. If any provision of this Agreement is held to be invalid or unenforceable, such provision shall be struck and the remaining provisions shall be enforced. iMediChart's failure to act with respect to a breach by you or others does not waive iMediChart's right to act with respect to subsequent or similar breaches. You may not assign or transfer this Agreement or any rights hereunder, and any attempt to the contrary is void. iMediChart shall not be liable for any delay or failure to perform resulting directly or indirectly from any causes beyond iMediChart's reasonable control. You agree that iMediChart may communicate with you via email and any similar technology for purposes relating to your membership or the service and any other services provided or which may in the future be provided by iMediChart or on iMediChart's behalf. This Agreement sets forth the entire understanding and agreement between the parties with respect to the subject matter hereof and supersedes all prior understandings, proposals, agreements, negotiations, and discussions between the parties, whether written or oral. 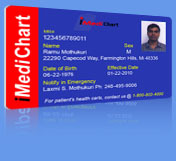 Fees for services offered by iMediChart are available at iMediChart's website http://www.iMediChart.com. I HAVE READ AND UNDERSTAND THIS AGREEMENT AND BY CHECKING/CLICKING ON THE "I ACCEPT" BUTTON BELOW, I AGREE TO BE BOUND BY ALL OF THE TERMS AND CONDITIONS OF THIS AGREEMENT.